In the words of Bob Dylan, “Times they are a-changin’”. This is especially true for apartments. Top apartment amenities are going through a massive shift. A recent study found that renters today prefer smart home amenities to traditional amenities like swimming pools. Why do renters prefer smart apartments? In short, smart apartments make our lives easier, more convenient, and frankly, more fun. Smart amenities help us automate routine tasks, save money, and find more time to do the things we love. Smart apartment amenities go way beyond devices. Let’s look at the top smart apartment amenities being offered today. Smart locks increase convenience and security for residents. They enable keyless entry into apartments via touchpad and mobile app. Residents can give remote access to building staff for maintenance and the smart lock will log exactly when they enter and exit the unit. Smart locks enable other cool amenities like apartment cleaning and dog walking services. Smart locks can alert the resident whenever their door is opened, wherever they are. 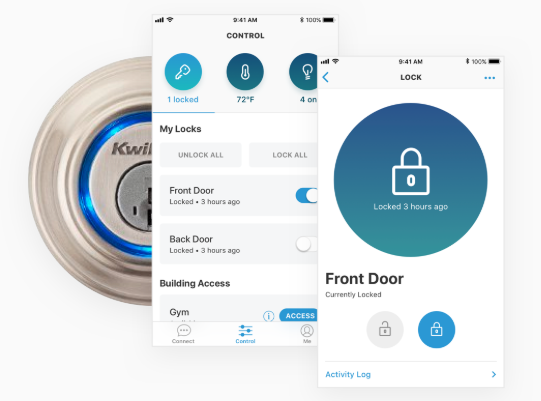 When connected to a smart security system, smart locks are even more powerful. Smart thermostats are often top of the list for desired smart apartment amenities. They allow residents to control their climate remotely and learn to make adjustments on their own. Heating and cooling accounts for nearly half of your property’s energy costs. Smart thermostats make buildings more energy efficient by allowing property managers to remotely control the climate of empty units. When connected to a smart apartment platform, smart thermostats give managers building-wide information on the state of their HVAC system. Smart lighting is the quintessential smart apartment amenity. It combines convenience, cost-savings, and the futuristic ‘cool factor’ that gives residents something to brag about. Smart lights can be controlled remotely or with pre-set custom automations. They can dim, change colors, and activate when someone walks into a room. Smart lights also save residents money by adjusting to sunlight and turning off when not needed. Property managers can also use smart lights to control costs in empty units and set the “mood” for apartment tours. One of the favorite smart apartment amenities is the all-in-one mobile app for residents. The mobile app gives residents one place to manage their rent payments, utilities, wifi, and communication with their property manager and roommates. Through smart apartment platform integrations, residents can even control their smart lock, thermostat, and lighting. The resident mobile app is like a remote control for your life. Everything you need can be accessed and managed right from your smartphone. Anyone who has recently moved into an apartment will remember calling their local ISP to schedule a wifi installation. Have you ever stopped to wonder why wifi doesn’t just “work” in apartments? Managed wifi as a service is the answer. 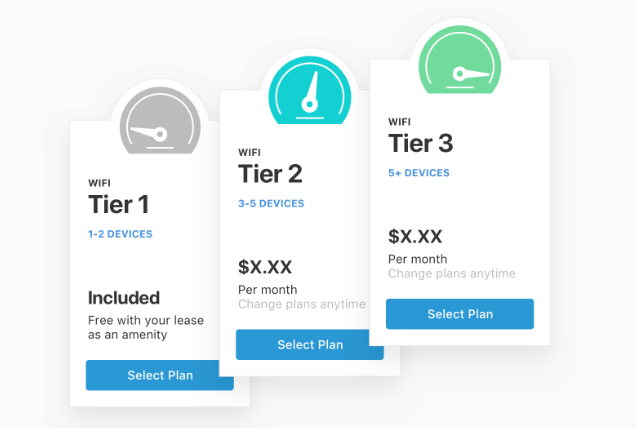 Smart apartments provide tiered bandwidth subscription plans that residents can purchase directly from the property owner instead of a carrier. This provides incremental revenue for the property manager and simple, reliable internet access for residents. Wifi can be turned on like a light switch, and residents can change plans anytime they want with a click of a button. Smart apartments offer tiered bandwidth packages directly to residents. Security is a big reason why renters prefer smart apartments, and smart access control is a key piece of that. Smart access control increases both security and convenience for residents and staff. It also tracks who is coming and going throughout the entire property. No device is more synonymous with “smart home technology” than the voice assistant. Amazon Alexa is changing the way people interact with their homes, and now renters can have the same experience. With Alexa integrated with your smart apartment platform, residents can access information about their rent, utilities, and maintenance requests. Home security systems are growing in popularity and might soon be a must-have amenity for renters. Smart security systems give residents mobile app controls and integrations with other devices like Amazon Alexa. Email is a hassle for both residents and property managers. Smart apartments do away with email and instead offer instant messaging through the smart apartment platform. Residents and managers can communicate in real time whenever there are questions or concerns. Residents can also message with their roommates, keeping all apartment-related conversations in one place. Smart apartment platforms automate and streamline work that used to take property managers several hours a week. Now managers can focus on the thing they do best: bringing the community together. Some smart apartment platforms offer a built-in Community Events tool that managers can use to create and share events. 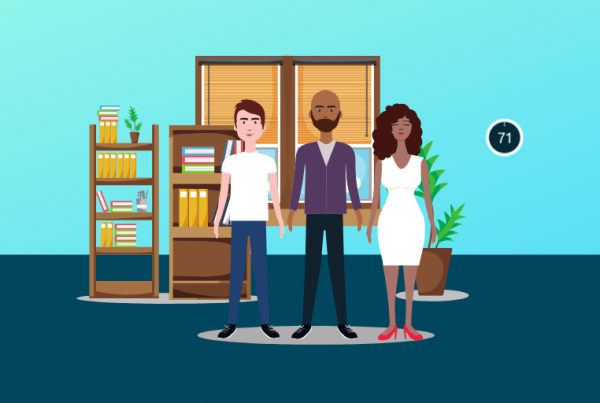 Managers can automatically invite residents, collect RSVPs, and send out reminders. No more flyers taped up in the elevator or stuffed underneath doors. Large apartment complexes are notoriously difficult to navigate, especially for Uber drivers. 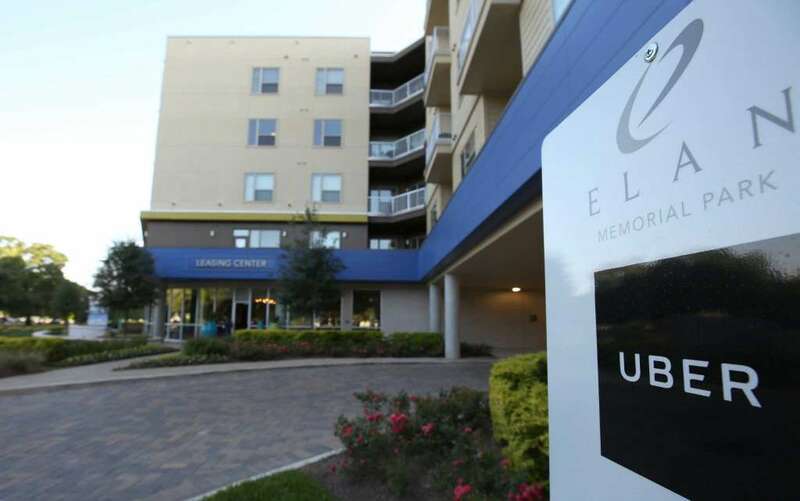 That’s why some apartment complexes, like those from the Greystar Group in Houston, have added designated pick-up and drop-off locations for ridesharing. Greystar partnered with Uber to add the designated locations, which are programmed into the Uber app. Riders and drivers are directed to meet at the location instead of trying to orchestrate the pickup somewhere in the complex. Greystar launched the initiative after a University of Houston study found that rideshare pickup spots would be a key selling point for tech-minded renters. Uber and Lyft are continuing to experiment with these real estate partnerships around the country. While not the most exciting amenity, automated package management is one of the most coveted by residents, especially after they experience it for the first time. With Amazon shipping more than 5 billion Prime packages in 2017, reliable package management is more important than ever. Smart apartments make it easy for property managers to receive and track packages in their possession. Residents automatically receive messages when their package has arrived. This streamlined amenity takes the guesswork out of package delivery. Taking package management to the next level, in-unit package drop-off might be the future of delivery. Thanks to smart locks and services like Amazon Key, residents could opt-in to have their packages dropped off inside their front door. This is becoming an attractive amenity as package theft continues to rise. In-unit package drop-off is not a common amenity yet, but the beauty of smart apartments is that they are virtually future-proof. Services like Amazon Key can be quickly integrated into the smart home platform because the hardware and software foundations are already in place. Bike sharing is a great way to get around a city, and some apartments are providing bike sharing stations on-site. In 2017, Talia apartments in Marlborough, Massachusetts added a bike sharing station for their residents. Talia partnered with Movatic, a mobility company that works with communities to set up private bike sharing systems. This is a fantastic amenity for residents who want the “Living as a Service” lifestyle, where convenience and accessibility are prioritized over ownership. Automated maintenance requests are actually a perk for residents and maintenance teams. Residents can easily submit maintenance tickets through the resident mobile app while property staff use the smart apartment platform to manage and assign tickets. Smart locks make maintenance access easy and secure, giving staff one-time digital access to units and alerting residents exactly when they come and go. Smart appliances save residents time and money by anticipating maintenance needs and using less energy. Some smart apartments are even equipping their units with smart TVs, providing a more turnkey experience for residents. This is all without mentioning awesome smart appliance features like fridges that automatically create your grocery list and Netflix built into your smart TV. Smart appliances save property owners money as well. Along with reduced energy costs, proactive maintenance can prevent big, costly repairs and could even extend the life of the appliance. Online payments hardly seem like an amenity anymore, but believe it or not, there are still some landlords who manually collect rent checks every month. This isn’t just a pain for property managers, but residents overwhelmingly prefer online payments as well. Smart apartments make online payments even easier by letting residents pay through the resident mobile app. Again, the resident app is like a remote control for your life, allowing you to manage and automate the living space around you. The smart amenities listed here are what residents prefer today. What will be the hot new amenities of tomorrow? It’s hard to say, but there are a few things we can do to be ready. 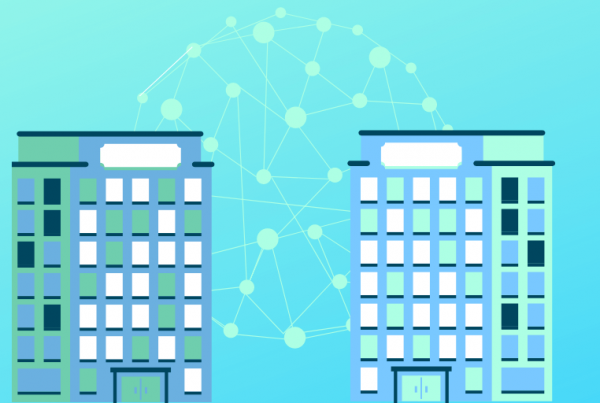 The first principle of future-proofing your smart apartment is to install building network infrastructure and a smart apartment platform. 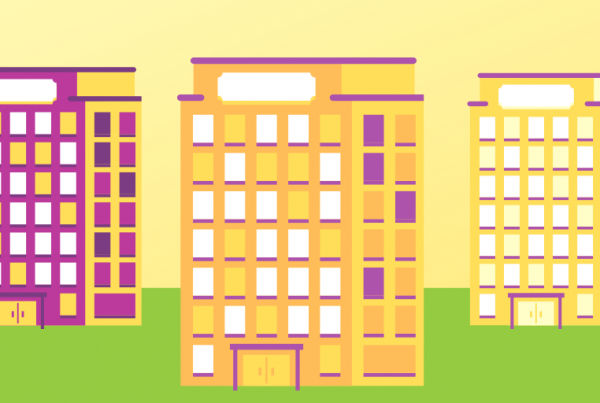 When new amenities hit the scene, you can easily plug them into your existing network. Next, remember to have a hospitality mindset when dealing with your residents. Renters have more options than ever, so service and lifestyle are paramount. Finally, as amenity preferences change, it’s important to stay flexible and change with them. 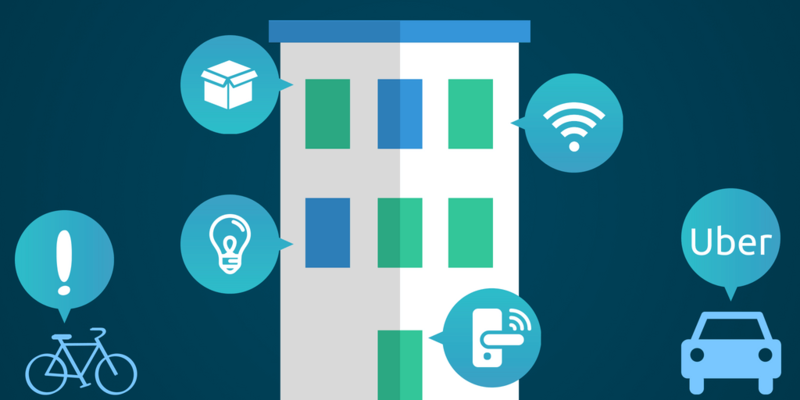 Smart apartment infrastructure and software will help you adapt over time. Smart apartment amenities are gaining popularity and there is no end in sight. By preparing for the future, we can start offering a better experience to our residents today.